Dr. Kunal Sindhu ranked more programs than he wanted to when he was going through the residency matching process last year. Sindhu applied to 112 programs: 89 in radiation oncology and 23 in internal medicine. He was invited to interview at roughly 30 and ranked 27. The process was exhausting, stressful and costly, Sindhu said. He ranked as many programs as possible to guarantee a match. He even ranked programs he admitted, âI don't know I would've been thrilled with getting. âLooking back, it was probably too many, but without a lot of information it seemed like a good idea,â he said. Sindhu isn't alone. Earlier this month, thousands of doctors started residencies at hospitals across the country. Those who matched well likely started with an eagerness to do well. That will result in happier staff and potentially better patient outcomes at academic medical centers, which work hard to maintain reputations for high-quality care especially in this era of increased scrutiny, measurements and reporting. Those not at their preferred residency may struggle more to find satisfaction working those long shifts and will be more prone to burnout. That, by proxy, could affect patient care. While expectations rarely meet reality, experts say the National Resident Matching Program could do more to properly pair residents with hospitals looking to get the most out of those four years. Like virtually every U.S. medical student, Sindhu was bound by the rules of the National Resident Matching Program, which oversees the residency selection process. Some specialties like urology have their own match programs, but the NRMP is by far the largest. The NRMP doesn't allow applicants or residency programs to confer on each others' ranking. Instead, both parties can only hope they ranked each other so the mathematical algorithm the NRMP uses will pair them. This algorithm, which is a version of one that earned its creators the Nobel Prize in economics, is widely regarded as the fairest way to select applicants for medical residency and fellowship programs. Before the NRMP was established, students sometimes had less than 48 hours to accept positions from programs. They were also disadvantaged by a larger candidate pool than there were positions. The current algorithm is designed to favor applicants over programs because it matches based on the applicant's rank order lists rather than the program's lists. However, physicians who have gone through the match question how fair it really is to applicants. They argue that because there is so much pressure to be matched—and there are limits to knowing how the process works—there is a tendency to rank more programs than actually appeal to them. The process is also very expensive for applicants who personally pay to travel for interviews. Applicants also can encounter residency programs that try to cheat the system. A 2015 survey of residency applicants across five specialties found nearly 23% of women were asked by a residency program to rank them highly in the match while 18.2% of men were solicited. The NRMP explicitly forbids applicants and programs from asking about rank in order to keep the process efficient and fair to the applicants, according to officials. And a 2015 survey supports this belief. It found that 74.6% of applicants asked to commit to a program by a hospital felt either uncomfortable or very uncomfortable sharing this information and nearly 30% said they were less likely to rank the program as a result. Violations of the match program, which carry sanctions, likely happen because of the enormous pressure on applicants to secure a spot and on programs to fill all their slots, said Dr. Peter Carek, chair of the community health and family medicine department at the University of Florida, who has written about the process. Physicians say residency programs aren't likely to see many complaints against them. The NRMP allows for anonymous complaints, but many applicants don't report out of fear of retribution later in their careers, Sindhu said. On average, the NRMP processes about 75 to 100 violations annually, Laurie Curtin, chief policy officer of the NRMP, said in an email. In 2018, 37,103 applicants sought the 30,232 first-year and 2,935 second-year residency positions, and 31,899 slots were filled. Despite programs and applicants skirting the rules, nearly half of applicants—48.5%—were matched to their top choice in 2018, according to the NRMP. Curtin said any violation of the match agreement can lead to applicants being removed from the match, although it happens “infrequently.” But no residency program has been withdrawn from the match “because to do so would be counterproductive to the mission and purpose of the NRMP.” However, programs with confirmed violations are flagged in the NRMP's web-based registration, ranking and results system for one to three years. There are other ways applicants and residents can game the system that the NRMP hasn't explicitly called violations. For instance, programs can tell an applicant they will be a good fit or give them assurance they will be ranked. Applicants can also express to staff that they plan to rank the program highly. But that doesn't always mean each party is being honest. Dr. Anupam Jena, a physician at Massachusetts General Hospital who has studied the match process, said he was shocked when his top pick didn't match him back even though the program director gave him enough positive feedback that made him believe he secured a spot. “I did feel a sense of betrayal. This is someone who basically wasn't being genuine,” he said. Sindhu said research shows that applicants will tell more than one program director they plan to rank their program highly in order to secure a match. The NRMP's code of conduct states that program directors “may freely express their interest in a candidate,” but they shouldn't ask the applicant to disclose information about other programs. The NRMP also forbids programs from soliciting post-interview communication with applicants, but research shows that applicants initiate contact rather frequently. While applicants aren't forbidden to reach out to programs, the programs can't use any of the post-interview communication when making their match decisions. Carek said the NRMP needs to provide specific phrases that are acceptable and unacceptable for both applicants and programs. That could be helpful both for matching and for improving residents' soft skills since residency interviews are often applicants' first real job interviews. “It would help the applicants to be given more direction,” he said. At Penn Medicine, Dr. Todd Barton errs on the side of caution as director of the internal medicine residency program. Each year, he trains Penn staff and residents involved in the interview process on proper conduct. While the NRMP allows a program or an applicant to say they will rank them or indicate they will be a good fit, Barton tells staff not to indicate those things to candidates. “There is an implied risk for some kind of return validation, and we don't want that,” he said. His program also doesn't solicit communication with applicants post-interview. Instead, at the end of interviews, Barton tells applicants they can reach out with any questions but “we promise them that any communication that happens after the interview day won't be referenced in any discussion of the ranking,” he said. Barton calls himself a “match believer.” He said the match is fair to applicants and gives them control over where they end up training. He admits a downside to the match process is applicants' tendency to over-apply, which adds a “staggering” amount of work for residency programs. He and his staff spend about five months out of the year simply going through all the applications. 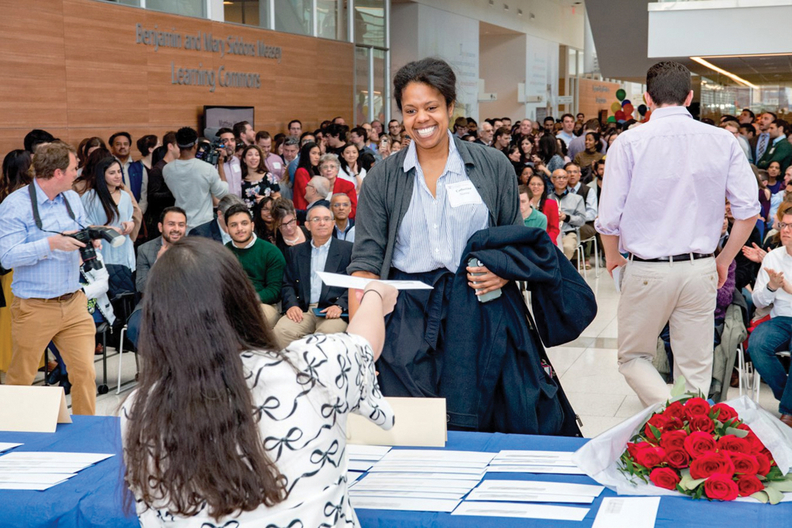 Penn's internal medicine residency program receives about 3,300 applications every year and roughly 300 students are asked to come in for an interview. Penn has 65 internal medicine residency slots it fills yearly. Dr. Amy Ho, for one, believes the slog is necessary. An emergency medicine physician, Ho went on 17 interviews. She said she interviewed with her top choice early on in the match process, but she was too nervous to rely on just that interview. Had she not matched, she would have to wait until next March to reapply.